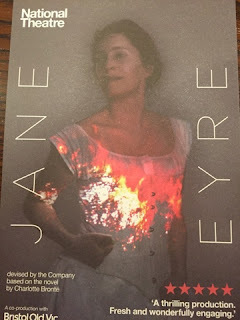 Last night Stuart and I went to see the highly acclaimed re-imagining of Charlotte Brontë's masterpiece Jane Eyre at the Lyttelton Theatre on London's glitzy South Bank. First staged by Bristol Old Vic last year, the story was originally performed over two evenings. However director Sally Cookson now brings her celebrated production to the National, presented as a single, exhilarating, dazzling performance. First things first; it's a great production. Exciting, inventive, funny, moving, incredibly well acted (and sung). The small troupe play all the roles both human and animal as well as creating many of the special effects using their bodies as props. Top notch stuff. The only downside is the perhaps length. 3 hours 20 minutes is bum-numbingly long. I can see why it was originally two plays. Maybe a bit of editing might have helped. But what to leave out? Based closely (a little too closely?) on the 1847 400 odd page classic the story tells of Jane Eyre, her childhood, schooling at Lowood, employment at Thornfield Hall, her romance with Mr. Rochester and her travels. The tale is one of bullying, morality, God, religion, social class, gender relations, love and passion, feminism, atonement and forgiveness, and the search for a home and family. So all the big issues then. Go see - but maybe take something soft to sit on.